In Elizabeth City, North Carolina. (36.2956° N, 76.2250° W.) Left the North Carolina Welcome Center on the Dismal Swamp Canal at 7:30 AM EST. Air temperature was 24 F. Water temperature was 42 F. Very cold trip to Elizabeth City. Expected it to warm up. When we arrived in Elizabeth City air temperature was only 40 F. Forecast was for 50 F. Traveling with Northern Express (Ann and Mike) and the William Reed (Reed.) Forecast for Albemarle Sound tomorrow not very favorable. May stay a day and do minor projects and shopping. I left JEB Little Creek yesterday morning in light rain.water temperature was 47 degrees, air temperature 40 degrees. Was about 15 minutes out of Little Creek when it started to rain. So in addition to being cold and having to hand steer all the way I was rained on too! When you see the picture of the smiling guy in foulies banging his way up upwind on a sailboat be sure to know - he is an actor. It is no fun at all. Made it to Deep Creek Lock on the Dismal Swamp Canal for the 1:30 locking. Docked between the lock and the bridge. I was cold, wet, and exhausted. Turn the propane heater on Reboot but it could not keep up with the plunging temperatures. They finally dropped to 29 F at about 10 PM and stayed there all night. By about 5 PM it was dark and XO and I were miserable. Everything was still wet and dripping. I was sore from dealing with the sailing and the shivers. I think I was mildly hypodermic as it took about 2 hours for my uncontrolled shivering to stop. This morning after coffee and donuts (supplied by Robert) I headed down the canal to the North Carolina Welcome Center on Route 17 (Latitude: 36° 30' 26.3514" / Longitude: -76° 21' 19.1304".) I waited until 11:30 so I would have the benefit of what sunshine there was for the trip. Air temperature varied between 40 and 42 degrees, the water temperature dropped by 4 degrees to 43 F. Forecast low tonight - 29 F. It is forecast to warm up slowly over the next couple of days. Tomorrow morning early cast off the South Mills lock and Elizabeth City for the night. I didn't make it out today. No only was it raining - something I could have coped with, but the marine forecast for tomorrow is gale force winds. Since the forecast for today was heavy rain and tomorrow light rain I figured I would get everything ready for a very early morning departure. That way even if I got hung up by the railroad bridges on the Elizabeth River I would still make Deep Creek lock for the final lock through. Then beep beep beep - weather alert. Gale force winds predicted in the Southern Chesapeake from Little Creek Inlet to the Hampton Bay Bridge Tunnel. In other words, the first 10 NM of my route. Great. At least I am getting a bunch of small boat projects done. This unit feeds back the rudder angle to the course computer on my Raymarine ST-6000 autopilot system. When the rudder was repaired in Sailcraft Service in Oriental the sensor was damaged when the rudder was re installed. In all fairness to Sailcraft I don't know if it was their fault or mine. After I left the yard I discovered that the electric autopilot was not working. Since I had just emptied my wallet at Sailcraft I decided to continue on to Virginia Beach and troubleshoot there. When I arrived in JEB Little Creek Fort Story it was clear that the sensor had been spun out of its range breaking it. It was time to get it repaired. 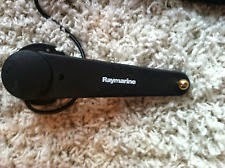 Since repair service at Raymarine can take a very long time, particularly in the summer, I opted to purchase a new sensor while I waited for the original to be repaired. My reasoning was that it was good to have a spare of this unit as the autopilot would not work without it. Last night and early this morning I finalized the replacement and got the autopilot working again. It's warm and the wind is from the South? North? The plan was to depart this morning. The forecast is for winds from the South gusting to 30 knots. Since I am heading south down the Elizabeth River this is not a good plan. But wait! Winds from the south. Cast off, head out due east from Hampton Roads, cross the Gulf Stream with a nice south wind to lay the waves flat. What a deal! Until I looked at the offshore weather (courtesy of Passage Weather.) Look ma, strong winds from the North. 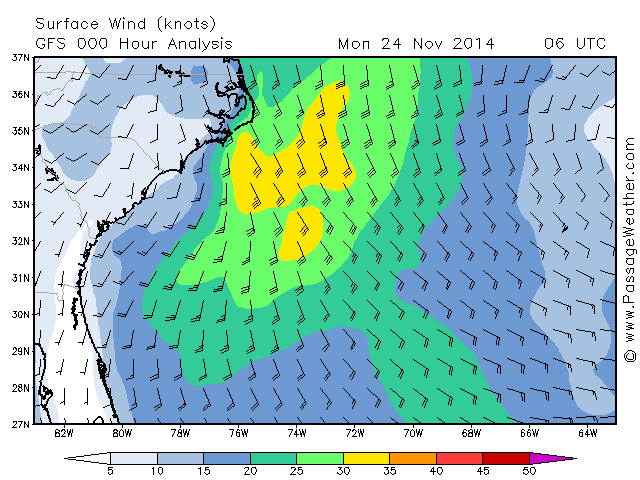 In fact, the yellow area is predicted winds of 30 to 35 knots. And across the Gulf Stream to boot! I guess that is not happening today. I am deferring my departure until tomorrow. I may get hit by rain late in the day. The tides are favorable for an early departure and the winds will drop and then shift toward the north. The temperature will drop about 10 degrees but I can deal with that. A standing joke between Ed and I is that Ed feels there is only once device needed on a sailboat: an iPad. We have a lot of fun with it. But sometimes he shows me some really neat apps on his iPad. I mentioned in a previous post that I helped Ed rewire his AIS, Chart Plotter, and WiFi (I think I actually said Ethernet but it was WiFi) The box on the left is the WiFi converter. It is from Digital Yacht This particular model talks high speed NMEA - the normal connection for AIS devices. There is also a model that talks low speed (4800 baud.) and I believe but can't find the link a version the interfaces with a NMEA 2000 network. The way we set this up on Hooligan is that the output of the AIS is broadcast over a WiFi link on the boat. Since AIS devices also contain GPS devices the Converter knows the location of the boat in addition to the location of the targets. These are displayed by an app on the IPad. Since it is all wireless Ed can walk around Hooligan and still have a picture of the AIS vessels nearby. I am sure the Captain of the USS Stark would have loved to have such a device! It is pretty cool. The downside is that it uses a TCP connection so only one device at a time can connect. We had the iPad and Ed's computer both trying to connect (the device does a great job delivering data to OpenCPN) and of course the software wasn't having it. But still, a pretty cool device in the $275 range. After I helped Ed rewire his AIS, Chart Plotter, and ethernet connection with new wires, terminal blocks and Dymo labels he laughed and told me that my solutions were "uptown." This is the new control panel I made for my new wind generator. The red button is a 50 amp circuit breaker, the switch will short the leads from the generator. The control circuitry in the generator knows that this means to stall the blades. One does this in high winds to prevent damage to the blades. The next big step (not while it is raining outside as it has been all day) is to actually mount the generator on the old radar pole. I hope to get that done in Oriental NC on my way to Beaufort. I had hoped to depart tomorrow but it just was not to be. For one thing I have not worked so hard in a long time, it wore me out. Got the propane tanks filled. Topped off the water tanks. Provisioned for up to 30 days without a store. Tried to do my laundry but was closed out by all the other people using the machines. So that will happen tomorrow morning at about 5 AM. Still have a couple of minor electrical glitches I would like to fix before I depart - in particular the autopilot (electric) is acting up. Since I intend to go down the ICW to Morehead City to avoid Cape Hatteras it would be nice if it were working. The vane steering is working so I will not be without the ability to take a break once in a while - just not as much as if both systems were working. The weather here as been very cold and is not really forecast to get any better so there is no point in waiting. It will be in the 50's day and 40's night next week so I hope to get clear of the coast, cross the Gulf Stream and head South within the next two weeks. Ed (of Hooligan) has a Spot tracker. He decided that he wanted something with more features so he purchased a DeLorme inReach. This device posts one's GPS position every ten minutes to four hours (user setting) and permits short text messages to be sent to any email or telephone address. The message recipient is sent a link to a web page that displays Ed's position and gives the recipient the opportunity to respond to the message. Unfortunately this requires linking to a web site. If you don't have Internet but do have a phone (like a satellite phone) it is not clear how one can respond to the message. The device is quite nice looking. I had some trouble getting the direction keypad to work properly. The screen is very small. Fortunately one can download an app to their iPad and interact with the device that way. It is a lot easier to read and simpler than trying to deal with the small keys on the device. "I am a freelance photographer." "So you get paid to take my picture?" "Maybe. I take pictures, send them to Saigon. If they use the picture they pay me." "I am here because I have to be. You are crazier than me." My Garmin anemometer cups arrived. Bill volunteered (again) to climb the mast. A quick trip up, snap on the cups, and a quick trip down. I now have wind speed on my instruments again. Yea! Thanks Bill. Fired up my trusty Sig Marine P-9000 propane heater to combat the cold. Did not realize that Sig posts propane consumption numbers on their web site. Even running on low it made an immediate difference in my comfort. These heaters are quite expensive but on days like today and are forecast for the next week they are life savers. I have purchased a variety of electric heaters over time. They seem OK for keeping your feet warm but don't do much of a job of heating the boat. The bigger heaters not only require a lot of power but are difficult to store. XO and I were buddies last night. I do have a mattress heater and we had it turned up. With a heavy blanket on top XO just kept snuggling up to me all night looking for the warm spot. It was most appreciated. The weather forecast through at least next Tuesday is for nightly lows in the 30's here in Virginia Beach. I don't think I will be disconnecting shore power (and therefore heat) anytime soon. My brother, Ace, a true "Native Son of the Golden West" has decided to return to his roots over the next few months. I expect that once he gets out to California (he and Sally have owned property there for years) he might actually join the Native Sons of the Golden West.I unfortunately was born in Flushing Hospital in Flushing, Queens County, New York City, New York. I was flushing from my birth moment. Anyway, we agreed that continuing to use his address as a mail drop while the house was for sale was not a good idea. My legal address continues to be in Madison, WI. The time as come. Actually, what happened is that Ed (Hooligan) found a new wind generator on E Bay. He bought it at a good price because he thought that his old wind generator was broken. The we fixed the old generator. So he sold me the new one. Went yesterday to get the stainless pipe to mount it. I was going to work on it today but it has been raining on and off. I am continuing the preparation for departure next week. Today I got the bottom cleaned. It was pretty clean, the anti-fouling paint was put on three months ago. The shaft and prop however neede work. So its all good. Yesterday morning we lost shore power. Actually they turned it off for the day to work on the lines. Of course this came as a great surprise since no one had told me. It was an interesting case of Reboot working too well. When the power went off the inverter kicked in. Now this would not have been a big problem except that I had two electric heaters running. They draw a lot of power. So as the batteries are trying to go flat the sun comes up and the solar panels kick in. Alas all they do is slow the inevitable drain. But the inverter is smart and as the voltage drops the low voltage alarm kicks in. The inverter stops producing power. The heaters go off. It gets really cold really fast (the water temp is 56 degrees, the air temp was about 50 degrees.) I wake up and shut everything off. Of course now I am freezing. But the good news is that I can make a cup of coffee on the propane stove. Which I do. Yesterday my dock mate Bill Reynolds helped me re-install my Garmin wind sensor at the top of the mast. Bill did the climbing, I did the safety stuff. This was a refurbished sensor to replace the one that had been damaged. 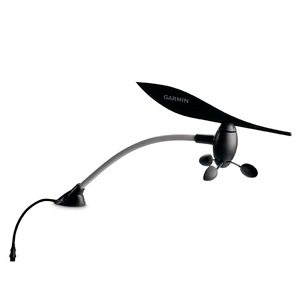 But when they sent it back they left off the anemometer cups. Now I have wind direction but no wind speed. Bill was very gracious. He suggested that we remount the sensor to make sure it worked electrically and that he would climb back up again when the anemometer cups came in. One of the smaller blessings of traveling by boat in the United States is that all the necessary nautical charts are free. Most everywhere else in the world obtaining digital charts is equivalent to paying for the birth of your first born (or second, etc.) One of the great things about the Internet is that creative people from around the world donate time and expertise to creating really cool software. Enter Paul Higgins from Canada. In his sailing experience he noted that many of the electronic charts were based on very old surveys. Surveys that were sometimes several nautical miles wrong. When going into Turneffe Atoll in Belize I noted that the channel I was in was shown about 1 NM north of my location on the chart plotter. Then I check the chart and found the last survey was in 1899, Not surprising there was a small error. What Paul has done is create software that converts a Google Earth image into a .kap file. In the process one can merge a nautical chart with the satellite image. The result is that when you load the .kap file created into OpenCPN the satellite image is displayed in the chart plotter. That big brown section of land is all of a sudden converted to a beautiful satellite image! The article that explains how to do this is here (Click Me!) With good charts (like the US charts) things line up. Other places not so much - which is the point of the exercise. 1) Getting the software downloaded is pretty easy, but getting things to work is a bit more difficult. 3) On the right hand pane find the "Overlay Chart/Image or OpenCPN pull down and set it to OpenCPN. This will switch the program over to creating a hybrid chart of both land and water. It will also change the instructions in the left hand pane. 4) Note that Google Earth has to be set for "Decimal Minutes." This is done in the Google Earth "options" pane. 5) The computer will open lots of windows, do all sorts of crazy things. At one point you will have to click an OK button for the process to continue. Don't touch anything else until the program finishes or the process will fail. 6) Once the chart(s) are created you will have to refresh the database in OpenCPN (Options - Charts) to pick up the new chart. It will show up as a blue bar at the bottom of the OpenCPN chart window. Note: There is a very nice Google Earth plug in for OpenCPN. However, I believe you need to be connected to the Internet for it to work. Obviously when one is offshore this is not going to work but it is great for planning purposes. There has been a lot of chat for the past two days in the marina bars about the weather. In particular we have all been hearing rumors about when the Salty Dawg and Carib1500 will depart. My prediction was the USCG would be doing a bunch of rescues as people desperate to leave departed and got in over their heads. Last night - Coast Guard Rescues Two from Distressed Sailboat. At about 10 PM EST last night the sea buoy (Buoy 44014) was reporting 30 knot winds and 18 foot waves. Not surprising that they got in trouble. I am waiting for Ed to make it back so this for me is theoretical. But it is good to get back in weather practice again. November 1st is a big day in East Coast U.S. sailing. It is the official end of hurricane season according to most insurance companies. That means it is the height of the snowbird migration South as boats transiting the ICW can cross the fabled Georgia - Florida state line. It is also the kickoff for the Carib1500 from Portsmouth, VA to Nanny Cay in the BVI and the Salty Dawg Rally essentially to the same place. As a result we have some 400 or so rally boats and a large number of snow birders here in the Norfolk, Virginia Beach, Portsmouth area. Leave it to Mother Nature to remind the sailors who is in charge. Last night the temperature dropped into the mid forties with winds in the high thirty knot range and gusts to fifty knots! A mini-Nor'Easter. It is not clear if it ever reached official tropical storm criteria but I am sure for a lot of people it made for a long night. Reboot was bouncing around to beat the band. She is sitting on a "T" head and is very exposed to winds and harbor chop from the North and Northeast. After a few unpleasant hours I decided to take a break and go on shore. The combination of being hit by a 50 knot gust and the fact that the floating dock was alive took me within inches of being thrown into the water. After a dinner on shore (OK, a hamburger and fries) I headed back to settle in for a long night. The wind had shifted slightly to the Northwest. The good news was this got Reboot off the dock so the fenders were not taking the load of being pushed up against the dock. The bad news was that in addition to a wind induced 10 degree heal I was subject to the sounds of the dock lines (all doubled up of course!) stretching and rebounding all night. Between the bucking and the heal just staying in bed was somewhat of a challenge. And yes, my lower back is killing me this morning. At times like this I wonder what XO (the wonder cat) is thinking. In particular what he thinks about the "really big cat" he lives with (me.) I have been told that cats think of humans as if they were other cats. (I have no clue how some researcher came to that conclusion.) Well, XO must have decided that the big cat was going to keep him safe. All night he was wrapped up against my body in a tight ball. The fact that I had also broken out the mattress heater and was covered with a thick blanket (thank's again Maury for the Abu Ghairb blanket!) certainly added additional incentive. This morning the winds have moderated to the 20 to 25 knot range. Still not comfortable but better than last night. At least it ia all wind with just a smattering of rain.